Power strips are a necessary part of protecting your desktop computer and its peripherals, but they’re not exactly pretty. Or, at least, they weren’t pretty … until Korean designer Sangki Kim created the retro-styled Powerdrobe power strip. Powerdrobe isn’t meant to hide amongst the dust bunnies on the floor – it’s made to sit directly under your computer monitor. Up to four plugs can be connected to the back of the device, while chrome power switches on the front keep energy vampires in check. You’ll also find a set of USB inputs and an easy-access outlet on the side for when you don’t want to mess around behind the box. 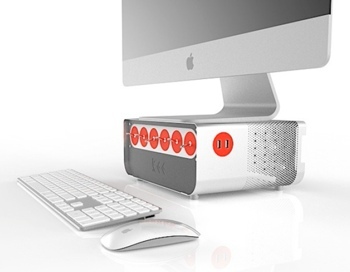 The four-socket version of Kee Utility’s Powerdrobe will be available next month at a MSRP of $40. A larger six-outlet version is also in the works, Engadget reports.